Needless to say, refrigerators are now a mandatory part of any household. In fact, a house without a refrigerator today of any kind is a rarity. Following the invention of refrigerators for home use in 1913, the landscape changed considerably. As food could now be preserved for longer periods of time, people found refrigerators to be incredibly useful on both a commercial and personal basis. Interestingly enough, commercial refrigerators were used long before home refrigerators were in use, though today this has undoubtedly changed. Refrigerators or ‘fridges’ as they’re also more commonly known, come in varying shapes, sizes, colors and functionalities. Let’s take a closer look at a few of the best refrigerators hand-picked for your convenience. 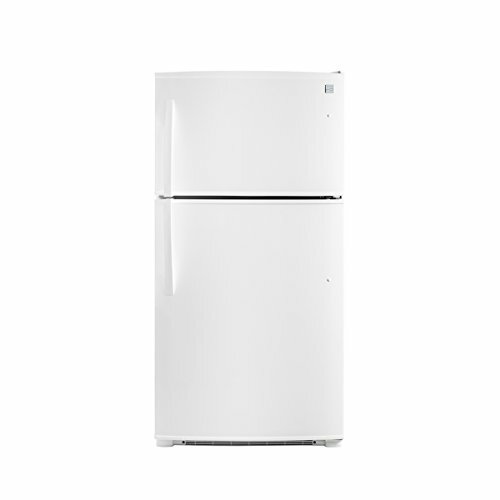 For under $1000, you could bring home this luxuriantly white refrigerator by Kenmore, bearing a capacity of 20.8.cu.ft. If white’s not particularly appealing to you, you can also opt for their black and stainless steel. It’s split-shelf capability also allows you to organize your space quite efficiently, and the energy efficient LED lighting lets you use it with utmost efficiency at all times. Best of all, no more struggling with ice-picks (or similar tools), trying to remove ice gathered in your freezer, thanks to the frost-free freezer, plus, you can also set this up in your garage if you’re cramped for space, as it comes with something they call ‘Garage-Ready’ technology, without need for an extra adaptor. The fridge itself is 33.8 inches long, 32.87 inches wide, and 66.1 inches high. Best to measure the space you plan on fitting it in before making the purchase. Sears Brands Management Corporation (Kenmore) - Misc. 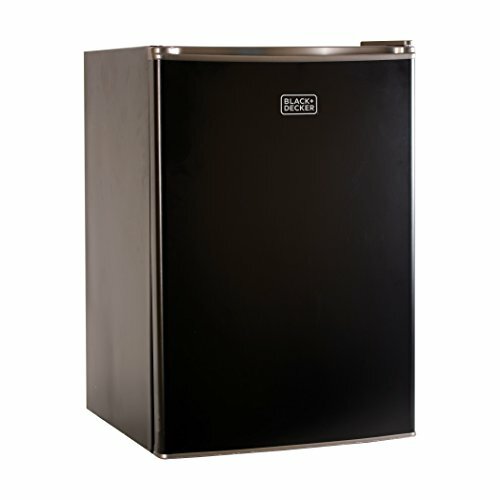 If you prefer black fridges, then the Avanti option is probably right for you. It’s great for families, as it comes with a host of useful functionalities. For starters, this too is Energy-Star rated, which means improved energy efficiency and reduced costs, and secondly, it comes with interior lighting and levelling legs, which help assure its capability and convenience. The sleek black color features a platinum finish as well, which makes it incredibly sophisticated as an addition to any modern-day home. We think that this’d also make for a great housewarming gift, or even a wedding gift for a newly married couple. There are two separate doors, setting apart the freezer from the fridge at the bottom as well. HiSense is a popular household brand, and as such is often trusted where electronic appliances are concerned. This one comes fitted with a single door, and a freezer inside which makes it non-complicated and quite straightforward for smaller homes say for singles or couples for instance. The stainless steel will not only ensure its durability and resilience with use, but also looks incredibly chic. You’ll also find crisper and deli drawers, as well as 2 transparent shelves. You can also fit 2-liter bottles into the door-bins, and, it’s Energy-Star certified. 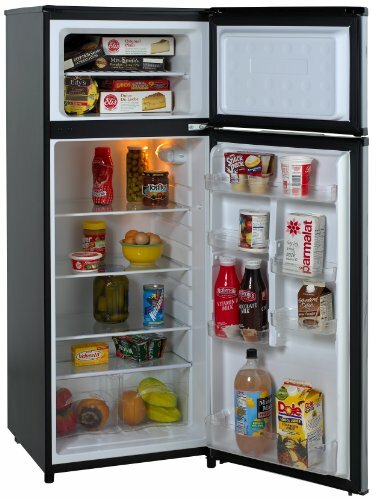 Considering the size, this is not exactly a fridge for a family or anything, but does a great job and is probably the best refrigerator for college students, or singles living on their own. The compact size and no-fuss design makes it suitable for pretty much any apartment and house, and even as a small fridge to keep in your bedroom if you wish. Though this one’s black, you can choose from the white and brushed metal finish depending on your preferences. Plus, seeing as how Black & Decker is a giant in the world of electronic appliances, we guarantee that you can enjoy peace of mind with this purchase. Fit in 2-liter bottles in the door bins, and make use of 2 full-width glass shelves to store your food. The adjustable thermostat control leaves temperature regulation completely in your hands as well. On top of all this, you can look forward to a reversible door, a flat-back design allowing for easy storage, and a complete year’s warranty on parts, with a 2-year warranty on the compressor. 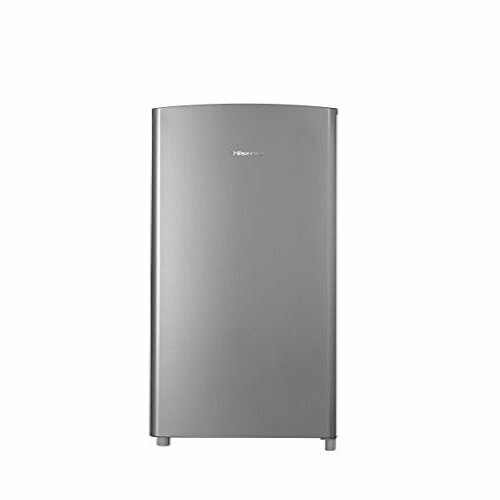 Last but not least, the Danby refrigerator as part of our list featuring best refrigerators. This one made the cut because firstly, we loved that it came in 5 different color options, namely Stainless Steel, Black, White, Black/ Spotless Steel and Red, allowing you to pick any based on your individual choice. Its total capacity clocks in at 7.3cu.ft, which is around 206 liters. What’s more, the cycle defrost system makes it super easy to maintain, and the easy-to-use mechanical controls makes life even easier. With 3 adjustable glass refrigerator shelves and 1 adjustable/removable wire freezer shelf, you can also expect maximum versatility and storage capacity. The reversible door-hinge also allows you to pretty much decide which way you want the door to open. Furthermore, it comes with an 18-month warranty on parts, and offers in-home service. What more could one want? Although buying or scouting out for a good refrigerator isn’t exactly rocket science and definitely nothing to worry about, it does mean you have to educate yourself about what you should be looking for. This’ll help you make a more informed decision at the end of the day. As such, we’ve taken the liberty of listing out some of the key characteristics anyone should take into consideration when looking to buy a refrigerator. One of the first things we highly recommend you look into is the Energy-Star certification. As you might’ve noticed, practically all the fridges featured here, have this. Not only does it mean good things for the environment, but also reduced energy bills for you. Secondly, measure the space you want to fit it in since that pretty much determines the size you have to get. Most people tend to guess, and end up with too large or too small fridges as a result. Additionally, you want to ensure it can be easily moved if and when necessary. Another important thing to look into includes the finish. Fridges now come in a variety of finishes, including stainless steel and fingerprint resistant, so it really depends on what you want for your household. If you have small children for instance, the latter seems like a good call. And finally, check on the noise emission. You want to be able to keep the refrigerator anywhere in your home with ease, and if it’s quite noisy, this won’t really be possible.